Join Nelly Cootalot in this indie adventure game sequel to a popular free game, and rescue birds hypnotised by the villainous Baron Widebeard. Explore a charming, hand-drawn world created by award-winning comedian and filmmaker Alasdair Beckett-King. What is Baron Widebeard planning? Can he be stopped? In what way is a frozen volcano involved? 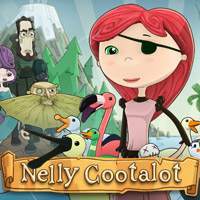 To answer these questions comes Nelly Cootalot: pirate heroine and defender of endangered and adorable creatures. Nelly's journey will take her from Port Rubicund in the South Seas to the lonely isle of Gloomholm in the icy north. She'll meet outlandish characters and face perplexing challenges in her quest for the Treasure of the Seventh Sea. In this game, Nelly will heroically: race aristocrats for fun and profit; be immortalised in folk song; join the Merchant Navy *shudder*; pilot an airship; uncover Bloodbeard’s Lost Treasure; take advantage of a short-sighted old man. Lie to strangers with no consequences. It features full voice-acting in English & German, art & animation in glorious High Definition, German, Spanish, Italian & French localisations, and over 45 unique characters & 35 locations.